Fighting poverty and promoting development with programs like the Marshall Plan is more productive than fighting terror and promoting fear. To quote Sir Winston Churchill "many forms of Government have been tried, and will be tried in this world of sin and woe. No one pretends that democracy is perfect or all-wise. Indeed, it has been said that democracy is the worst form of government except all those other forms that have been tried from time to time." Education, freedom of the press, government uninfluenced by special interests and an open society are necessary for democracy to be the "least worse" of forms of Government. Otherwise casting ballots once every 4 or 5 years becomes a perfunctory exercise devoid of meaning. My phone is my pal? - Conclusion #1: I am not addicted to my phone. Not really a surprise. - Conclusion #2: Ray Bradburry may have been very right in Farenheit 451. Scary. - Conclusion #3: We are headed towards a future in which an overwhelming proportion of the population will use one single device to perform a number of transactions previously executed with different devices and industries like payments cards had better watch this space. This is going to be fun for me. - Conclusion #4: a cool company I was telling you about a few weeks ago (Mocom - www.mocom.lu) has a great opportunity in the UK. Go for it! - Conclusion #5: because of natural limitations of bandwidth in mobile networks, BitTorrent or similar approaches are likely to become no-brainers to deliver content to users on the move, pretty much like jamendo (www.jamendo.com) does. Open music on the go? - Conclusion #6: marketing tactics of the GSM industry are worth considering as sources of inspiration for other offerings on the market. If they have managed to be granted such an important place in people's minds, they must be doing quite a few things right. Let us analyze this! There is currently a seemingly endless and definitely time consuming debate in Europe about the reduction of the VAT taxation of a number of goods and services. The objective, proponents say, is to create jobs. I may have forgotten many important things from my economics classes, but I really don't see how the reduction of a tax on added value will induce the creation of jobs... There is one word at the back of my mind: demagogy. field of human activity. Again, after careful consideration and having myself fallen several times into the trap of blaming, repression and rejection, it seems to me that transcendence and inclusion is a good way to go, even though it requires some reform of the individual items that are to be transcended and included into a higher level of evolution as Ken Wilber argues. there are many things we said then that have been unfolding since 2003.
in this exciting Web 2.0 era that is now starting. Here is an interesting list of entrepreneurs that serve a higher purpose while at the same time doing business. I really like what these guys are doing. Pragmatic durable development. While researching the dynamics of what is now conventionally called Web 2.0, thinking about the impacts of these new ways of using infotech to deliver valuable services to the users of the web, I examined some of the interactions between the various stakeholders from a psychological perspective. In particular I focused on the debate going on in France these days about copyright, music sharing schemes and peer-to-peer. What I see is a conflict between very different sets of people that can be see in different ways: established players vs challengers, conservatives vs progressives, pro-regulation vs anti-regulation, capitalists vs alter-capitalists and anti-capitalists, worshipers of rules and rationality vs adepts of artistic intuition... Of course I am biased in the way I analyze the situation, but at the end of the day that is not so relevant. The question is rather to see whether we are capable to move beyond conflict; not to deny the confrontation of ideas, values and ideals, but rather to extract from it something larger that "transcends and includes" as C.G. Jung or K. Wilber would suggest. Do we have to be in an "EITHER-OR" frame of mind? How can we move towards an inclusive way? For example, what means could allow long-tail players like jamendo to harmoniously coexist on the market with more traditional players (even though some of the traditional practices will have to evolve to allow transcendence and inclusion to occur)? And figuring out whether the "quiet revolution of the tail" can be durably repressed by the establishment is another interesting question. Again, using history and psychology of the unconscious mind, I would bet that what is repressed eventually comes to center stage, if need be violently (which is perhaps why some philosophers like Jiddu Krishnamurti claim that extreme differentiation is the root of violence, but that is another topic). I have been using jamendo for a couple of weeks and I am just amazed by the quality of music published through jamendo. For example, I discovered a Belgian group called Silence whose creations are simply superb. Now, I live in Belgium... Was there any chance whatsoever of me being exposed to their music through traditional media? My answer is no. So jamendo can also bring you Silence, or indeed perhaps the next "Sound of Silence", that media majors have missed simply because they cannot handle the amount of music being created ina world where the cost of creation is going down (I mean the cost of technical production and replication of creations, not the pain of the creator) and the cost of error is near zero. In fact there is a big, a HUGE difference between jamendo and traditional ways of accessing music: with jamendo and thanks to their tagging system I ACTIVELY select my style. In fact, jamendo is very much one of those "life-style enablers", i.e. a tool helping me choose what suits me in a world of ABUNDANCE of CREATIONS and therefore SCARCITY OF ATTENTION. Another example would be Pandora (www.pandora.com). The way it is being done is considerably more powerful than older approaches to the web (profiling, permission marketing based on my selecting pre-formated categories, portals...) because it is based on the principles of an interactive, social, peer-to-peer web. In fact what we are seing is the emergence of a new way of organising the value system of the media & entertainment industry. And I think the debate around licenses and IP rights is in fact an economic war between competing channels of production and distribution, one established and costly and the other one disruptive, relatively inexpensive and fairer to creators. I personally believe these two ways of doing can be complementary and that the traditional value system will have to adapt practices and shed a few bad habits of the past. Anyway, Silence is great if you like quiet electro music and I recommend it to you. Check it out on http://www.jamendo.com/be/artist/silence/. Here is an interesting interview about the fact that people (we) are increasingly autonomous and able to innovate without being part of a superstructure. IMO this is precisely what the extraordinary innovation wave of the late nineties in the Valley was all about: R&D on an unprecedented scale. I am just impatient for the time when people will be able to "print" their integrated circuits or microstructures without using the services of fabs at least for prototypes. We are about to live exciting times (again) and I feel privileged to be working with a couple of innovative start-ups in Europe helping them develop their business. I am absolutely appalled at the fact that, in Europe too, peer-to-peer technology (and perhaps technology in general) is often equated to piracy and disrespect for authors' rights. Don't shoot the messenger, please! P2P is really just the means and it can serve several ends, just like an axe can be a useful tool or a deadly weapon. I personally believe P2P is a fantastic enabler for many businesses, including the entertainment industry, only the value system is likely to change a lot and its beneficiaries may not be the traditional middlemen. What I have been reading these days about the media & entertainment industry only confirms jamendo has a great contribution to make to free music in an open world. Superb photos and the "perfect green apple syndrome"
Which makes me think that quality may be more a matter of the way one approaches a field rather than the amount of tips and trick he or she knows about the field. Which, of course, is a challenge to the way talent is assessed and recruited in more established environments. I call this "the syndrome of the perfect green apple", or "why the average consumer will mostly buy unsavory apples that look perfect". I recently read a post on a friend's blog that deals with the issue of recruitment of IT professionals; it's worth taking a look at what David says and I know he is the type of guy who looks at substance rather than mere appearance. In many ways David and Roberto share values and ways of doing that are great to have in this world IMHO. For the past couple of weeks I have been researching on the business implications of what is called Web 2.0. I cannot say my vision and understanding is clear at this point. It seems to me though that this new stage of the web's development is about to bring very significant enhancements for the non-technical user (like me). And unlike what happened back in the late nineties, the way Web 2.0 tools are presented addresses user benefits as well as technology aspects. That is very encouraging. The first tools that are being presented bring tangible benefits to "end-users" in domains that are fun to explore: blogging, social bookmarking, music and multimedia. Striking contrast compared to the way the first phase of the web was "marketed". I believe the web is here to stay and we have only seen the tip of the iceberg in terms of its influence on business and everyday life. Follow this link for an excellent analysis of Web 2.0: http://www.oreillynet.com/lpt/a/6228. Like in many situations, including in business, what you see is what you want to see... I was just amazed by this view and by the shape given to the snow by the violent winds that blew during the snow storm of early January. 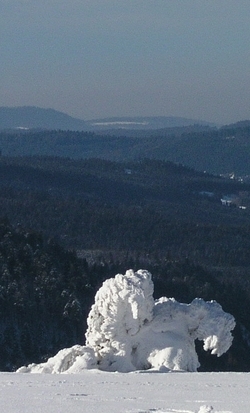 This picture was taken on the Route des Crêtes in Vosges, France on a cold but sunny day of January. In one of my assignments of 2005 I worked on a company's test plan and on that occasion I realized how tightly coupled the formulation of requirements and the testing of the software can be. Of course, this is nothing new, except this is not so common in practice, like many other things "that everybody knows"... but nobody really applies. What I find striking is the parallel between some of the methods developed by the neurolinguistic programming (NLP) community and the principles behind software development methodologies of recent years. More specifically I refer to the V-model and to agile methods. The first creates an explicit link between the various stages of a development project and the creation of the test plan; in NLP "testability" (i.e. how does one know from visual, auditory or kinesthetic input that something is "real") one of the criteria of proper formulation of objectives. The latter are based on a set of assumptions amongst which is the fact that iterations help better capture requirements. When working with someone using NLP "techniques", I always run through several iterations of the way that person "creates" the problem especially by reformulating what my counterpart is saying or expressing in a non-verbal manner. I find this parallelism quite interesting because I often come across a generally accepted idea that people are easier to understand and manage than machines (coming especially from people who have had consistently bad experience with IT projects and software tools) and also because NLP was heavily influenced by computer science when the approach was created. At the end of the day the success of a software project is very much influenced by the quality of human communication and by the commitment of the various teams involved in the process. So I guess that the combination of modern methodologies and human communication skills is an important asset to keep out of harm's way and to consistently move towards project success. A fascinating bunch of talented creators based in Luxembourg and Eastern France are behind this amazing initiative of perfectly legal peer-to-peer music sharing and distribution platform. I am very excited to have them as my customers and I believe they make an essential contribution in letting artists be heard and in offering a credible alternative to mass marketed music. Jamendo is an example of doing business in an open world that is also a world of abundance and scarcity of attention. So this is an invitation: try it and let's jamendo! Just got back from a few days off in the Vosges, France. Lovely place, great break, clean air (by the way do you think smoking is a lot worse than what we breathe in our cities?).. Lots of thoughts. And great inspiration from a refreshing book written by two Frenchmen who spent 15 months tavelling and studying over 100 economically viable and socially & ecologically durable operations selected out of an initial sample of over 500 initiatives. Overall it is a really refreshing set of stories that will show you that the often crazy rule of venture capital and Wall Street are not the only avenues to grow businesses. It also asserts that businesses can be far more than financial black-boxes worth the net present value of their hypothetical and "perpetual" future cash-flows. There are other ways to create and to grow.